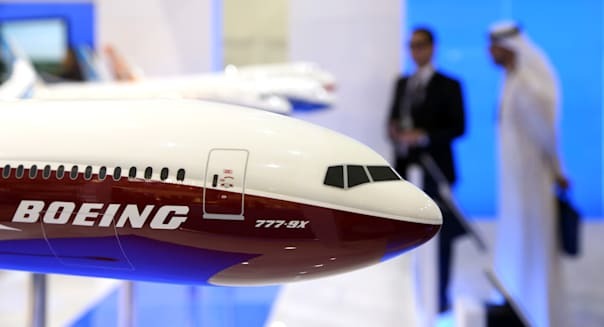 • It was a good day in the desert for Boeing (BA), as Persian Gulf airlines placed several huge orders to open the Dubai Air Show. Dubai-based Emirates Airline ordered 150 new Boeing 777-Xs at a price of $76 billion. Nor did Emirates leave out Airbus, ordering 50 A380s for $23 billion. Other deals for Boeing came from Etihad Airways, Qatar Airways and Lufthansa, which picked up a total of 109 777-Xs. • When a customer has a bad experience, a common response nowadays is to vent their frustrations in a scathing online review. And given the First Amendment, you'd think that there would be little the company in question could do about it, as long as the review didn't rise to libel or slander. But that isn't stopping a company called Kleargear.com from trying: In response to one couple's negative review, the company hit them with a $3,500 fine, and damaged their credit. %VIRTUAL-article-sponsoredlinks%• American society may be deeply divided on issues around guns and gun control, but for investors, Quartz reports, the numbers point in a fairly clear direction: America's firearms industry is probably still a buy. • In the latest Apple (AAPL) vs. Microsoft (MSFT) news, an interesting tidbit. There are reports that Apple has spent $345 million to buy an Israeli chipmaker whose 3-D machine vision technology was used, among other things, to power the XBox Kinect. • And finally, the ex-chairman of one of the Great Britain's largest retail banks was caught buying cocaine in a sting by a tabloid newspaper, CNBC reports. He was also caught on camera discussing his use of ketamine and crystal meth, and there are allegations that he'd smoked crack as well.